It really boils down to a half-bag of charcoal. For as many years as I remember, my mother has never shown up to visit me without a gift, a present, a thoughtful something she found somewhere that reminded her of me and she’d be darned if that item didn’t land in my hands soon, soon, soon. 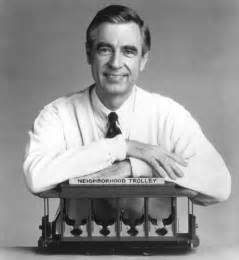 I paraphrase Mr. Rogers who remarked that in times of uncertainty or trouble, look for the Helpers. They’re the people taking charge, certainly, running into the fray to fix things, but they’re also behind the scenes, cleaning up, erasing the rubble so as not to remind anymore. They’re the silent folks who stand in one place, unobtrusive, calm, ready and waiting for the troubled to approach. They’re the ones who feet called to be specifically there, specifically then, holding onto an object for reasons they can’t fathom until it comes in handy to complete strangers. They sit and wait for something they can’t define with faith that things will come clear. For the last two weeks, a loved one has been undergoing life-altering medical procedures that have blessedly kept him alive so he can continue his mission of service to God and his family. His helpers range from doctors and nurses, to bedside family, to friends preparing feasts for the vigilant, to specialists and engineers in other countries who built machines never dreamed of a few decades ago but that now extend lives. Helpers are miracles dropped into a course of events. That same day I texted friends, asking for prayers from states away. Requests linked into a multi-state chain spanning the prairie to show God how much Oklahoma needed a hand. The prayer blanket, comforting in its weighted concern, seemed visible. Family who couldn’t be at the hospital sent a basket of chocolate the likes of which I’ve never seen except — maybe on one of those air flight catalogs — because sugar is a love language we all understand. And what happened? Well, hello: chocolate, a magnet. So sharing happened, and then stories bubbled up, followed by laughter, and proximity, the kind that calls to anybody wandering by, asking them to huddle up, to lean in with kindness and compassion and faith. And pass the truffles, please. Then there’s my Bubs, who doesn’t understand the enormity of everything because he’s a kid, whose responsibilities include school, band, after-school obligations, all things I need him to continue, because it buys time for me to wrestle comprehension to the ground so that I can be a parent and he can be a kid. On the other hand, he wrangles with gravity, too, not understanding enough to know how to put together the questions roiling in his head. In came his helpers: school personnel I recommend any family adopt. They’ve been right there, all day with the Bubs, lifting the weight with him. How do you say thank you big enough to people like that, who go above, beyond, over, and through the realms of job requirement to solid human compassion for this one awesome kid as well as the other four hundred plus who walk the halls everyday? A fruit basket doesn’t seem to cut it. All of this has a point. My Helpers, Bub’s Helpers, the family’s Helpers: I see you. And I am so grateful. And though the limits of space or money or time may impede the appropriate responses, those of us in your care thank you. I hope one day to repay the love and kindness while you don’t need it, while things are fine, while life is plugging along beautifully. But if crisis comes, I will be there. With prayer. And hand-knitted socks. Or food…maybe that someone else made, because you’ll want me to spare you from my kitchen endeavors. Or I’ll bring a half bag of charcoal. You know, whatever you need.